After the problems we experienced at Croft we were expecting a much better result at Donington. Sadly, this was not to be. With no practice on the Friday we had no opportunity to try the car and gauge what the set up should be for a wet meeting and so we when into qualifying on Saturday not knowing what to expect. Lewis only managed to qualify in 9th position but if he could have improved by 1/10th of a second he would have moved up 4 places! That’s just how close the grid was. Racing took place on Sunday and the heavens opened up, it was so wet that at one point the meeting looked like it was going to be abandoned. Both races did finally take place but over a reduced distance in what can only be described as monsoon conditions. Lewis finished 7th and 9th which was not what we hoped for but he came back safe and with no damage so I think we should be grateful. Lewis finishes the season in 5th place in the Championship, whilst the team finish in 4th place. For our first year in TCR, both driver and all team members did a fantastic job giving us something to build on next season. We hope to not only push for TCR UK honours but hope to venture into TCR Europe on some occasions. 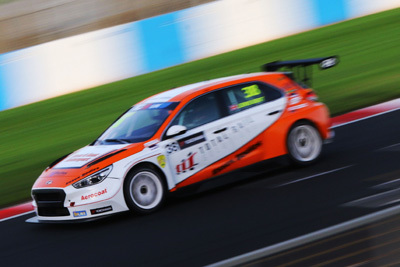 This entry was posted in Race Reports, TCR UK and tagged Donington, Essex & Kent Motorsport, Essex And Kent Motorsport, Lewis Kent, TCR UK, TCR UK Touring Car. Bookmark the permalink.